Look, this is really difficult to say, and I’m not sure why, but it’s hard to deny that Vampire Weekend are one of the most individual and important bands of the past five or so years. Okay, so I think I do know why it’s difficult to say - I want to hate them, and so does America! They are the 1%! Hearing Ezra Koenig croon in a semi-affected falsetto about the way he or his characters gaze sad and unsatisfied over the beautiful seascapes of Cape Cod and dream of fleeing yacht-style to somewhere, I don’t know, with a higher ratio of lighthouses to sun-drenched rocky coves where perhaps they can find happiness is among the most infuriating experiences in the history of the modern song, but it sure is pretty. Arcade Fire remade damaged adolescent folk-pop in the image of Neutral Milk Hotel, and LCD Soundsystem was basically the post-punk section of any given record store tossed in a blender, so what exactly is the Vampire Weekend? Some anomalous entity sprinkled with a peppering of Paul Simon, dashed with some baroque stylings and wrapped up nice and warm in a Vineyard Vines sweater? Yeah, that’s about right. 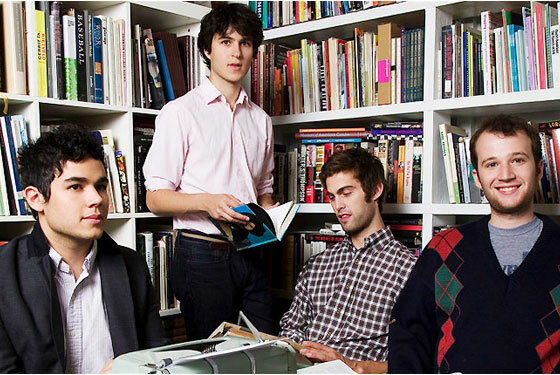 There is not another Vampire Weekend, and there shan’t be. The groups latest record, Modern Vampires of the City is indulgent as ever, full of ceremony and superfluous ornamentation the likes of which could incite a new Protestant reformation, but the novelty is gone. No longer content to be some New England tourist attraction, this is a band reaching maturity, in this case with an excellent pop record that’s varied, beautiful, racing and calm, and still very, very them.